The library and UNC Lineberger building doors are locked from 5:30 p.m. until 7:30 a.m. next business day. Entrance to the library and the building by authorized users during evenings, holidays, and weekends is controlled by keycard. Although the library is not equipped to offer routine computer service or study space to users not affiliated with UNC Lineberger, any resources or expertise unique to our library will gladly be made available. Desktop computers are provided for searching databases and obtaining journal articles or other research material. The library has two printers for library-related hard copy: a duplex monochrome laser printer and a color laser printer with high memory capacity to handle large PDF files. The desktop computers are accessible only by UNC Lineberger network registrants. Library materials may be taken to any photocopier within the Lineberger building and returned promptly to the library. Copies are charged to a lab or administrative account and a code is needed to use the copiers. Visitors who need copies should ask the librarian for assistance. The library has wireless access. Laptops registered with the UNC School of Medicine may be used for Internet access via wired or wireless connection. In order for registered laptops to access the wireless connection, they must also have the proper wireless network configurations. For help with registering your laptop with the UNC School of Medicine and configuring the wireless network, contact UNC Lineberger’s IT Support. 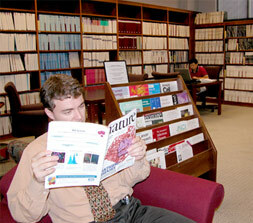 Journals: Print copies of high priority periodicals are purchased and retained for several years. Virtually all journals needed by our users are available electronically, with 4,000 biomedical journals and over 40,000 titles in all subjects licensed by UNC Libraries. Reference: Our reference collection comprises print copies of medical and scientific dictionaries, laboratory manuals, scientific handbooks; publication style manuals from the American Medical Association and the Council of Scientific Editors; core documents from the University of North Carolina and from government agencies such as the National Cancer Institute, the Centers for Disease Control, and the North Carolina Center for Health Statistics. Electronic Information Sources: The UNC Library system and UNC Lineberger provide our users with electronic access to essential clinical, scientific, and public health databases, journals, reference materials, and textbooks.